Marvel Studios has a reputation for raising the superhero movie bar higher and higher with each and every new release. There has been a total of 14 films since they kicked off the Marvel Cinematic Universe with Iron Man way back in 2008, but Doctor Strange will be the first to venture into the psychedelic world of mysticism. The Scott Derrickson-directed film pays homage to Steve Dikto’s creation by filling the screen with mystical landscapes, M.C. Escher-like bends, and psychedelic visuals that will make even the casual fans cheer. While it is visually stunning in more ways than you can count, Doctor Strange does have a few narrative and pacing flaws. But it is not enough to hurt the overall enjoyment of the movie, as it just retreads familiar territory but with stunning psychedelic visuals. Check out the full review below. Doctor Stephen Strange (Benedict Cumberbatch) is a world-renowned neurosurgeon who is known for his life-saving surgical techniques, knowledge of chart-topping billboard songs, and having a massive ego. His nearly flawless medical record fuels his arrogance to a point where he pushes his fellow colleagues away. Even his best friend Christine Palmer (Rachel McAdams) knows better than to get into a relationship with him, despite his repeated efforts to sweep her off her feet. However, his world comes crashing down when a distracted Strange is driven off the road, and his hands are crushed in the process. Realizing that he may never be able to perform surgery ever again, Strange puts all his money in an effort to bring his hands back to what they once were. When it becomes clear that modern medicine can’t save him, he uses whatever is left of his money to travel to Katmandu, India to find the mysterious Kamar-Taj in hopes that he can restore his hands. But of course, things are not what they seem, and once he opens his eyes, with the help of The Ancient One’s (Tilda Swinton) best student Mordo (Chiwetel Ejiofor) and Kamar-Taj’s librarian Wong (Benedict Wong), Strange learns that there is so much more to this world than what’s on the surface. That’s where he learns of Kaecilius (Mads Mikkelsen), one of the Ancient One’s former students who created his own sect of Zealots. On a visual level, Doctor Strange is a cocktail blend of Inception, Steve Ditko’s art, and steroids. Derrickson makes full use of repetition, rhythmed and patterned art to create a kaleidoscope effect that is nothing short of hypnotic and stunning. It pushes boundaries of visual effects and is unlike any other visual effects-heavy movie we’ve ever seen before. Even without the kaleidoscopes, the film utilizes its mind-bending effects by implementing M.C Escher influences as architectural structures and horizons bend like paper. When seen in 3D, the depth perception only enhances the art of the characters’ sorcery. But Doctor Strange does suffer a bit from uneven pacing and a somewhat clunky narrative. The plot is pretty clear cut and dry, and because it’s an origin story, it’s nothing we haven’t seen before. Derrickson, Jon Spaihts, and C. Robert Cargill‘s script plays it pretty safe, but sets up the expectation a bit high when it opens with a mind-bending visually spectacular action sequence between Swinton and Mikkelson. While the standard origins story of Strange becoming the title character can feel a bit predictable, the film does try to separate itself with a few interesting plot twists. So just think of Doctor Strange as a trial reboot of the Iron Man story but with a little more nuance. Also, there is a sincere effort to change the way we see villains in the MCU. Normally, they are flat and boring two dimensional characters. But here, Kaecilius has some interesting motivations. However, because the film does not spend nearly enough time on him as it should, it’s hard to sympathize with him, and thus he isn’t as exciting as he should be. Cumberbatch’s performance helps hold everything together and has us believe he was born to play the title character. He is a charming, wealthy, intelligent, and arrogant man that might resemble a certain Stark. So in a way, the film feels a little like a trial reboot of Iron Man. Which is not a bad thing when you consider the other factors like the stunning visuals, the supporting cast, and Michael Giacchino‘s alluring score. Swinton and Ejiofor also give solid performances as The Ancient One and Mordo, respectively. Wong isn’t the tea-making manservant that we’ve seen in the comics; instead, he is a strong knowledgeable librarian who doesn’t put up with Strange’s nonsense – although you will see it does have a small effect on him. And one of the best characters in the film isn’t even human. Doctor Strange’s Cloak of Levitation will surely get audiences laughing as it has as much personality as Magic Carpet from Aladdin. They are practically cut from the same cloth – so to speak. Despite the controversy surrounding Swinton’s Ancient One, the film does offer an explanation as to why she is different from the usual portrayal in the comics. Whether or not the explanation is accepted by those who are offended remains to be seen. In a way, Doctor Strange pushes the boundaries on visual effect movies, but it doesn’t reinvent on a narrative level. And that’s okay, because the film is still a really fun ride thanks in part to the visuals. 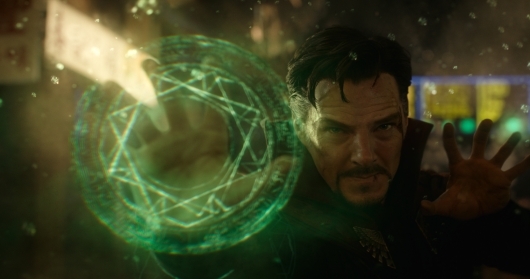 To Derrickson’s credit, he uses these very intense visuals to expand the mystic side of the MCU in bold and inventive ways rather than use them for the typical mass destruction you’d normally see in a blockbuster movie of this size. Yes, it does suffer from some narrative flaws, but the film makes up for those mistakes with a pretty thrilling ending and one that would make Steve Ditko proud. So while Doctor Strange isn’t best Marvel Studios’ film, it still is a thoroughly enjoyable thrill ride that will do more than put you on the edge of your seat. Be sure to stick around for two post-credits sequences, one of which hints at a sequel while the other brings back an old friend – I’m not even going to give you a hint on that one, just know that you’ve seen him before.